Saulius Auglys was born in 1969, in Ukmerge, where he began his music studies. He is a graduate from the Vilnius J. Tallat – Kelpša Conservatory.. 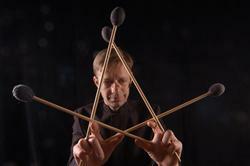 In 1988, he started his work at the Lithuanian National Opera and Ballet Theatre and since 1993 he is the head of the percussion section of the symphony orchestra of the theatre. S. Auglys studied the art of marimba with the marimba player Linda Maxey from the USA. At the moment Saulius is a lecturer of the Lithuanian Music Academy, director of “Drums and percussion festival” in Lithuania, International percussion competition's founder and organizer. During his studies at the Vilnius J. Tallat – Kelpša Conservatory, in 1987 S. Auglys won the first prize in the competition of young performers in Lithuania. In 1999 S. Auglys together with the accordionist Sandra Kleizaite won the second prize in the competition of mixed duets. S. Auglys is the organizer as well as the participant of the international percussion festivals in Lithuania. S. Auglys is often invited to assist other Lithuanian symphony orchestras such as the Lithuanian State and the Lithuanian National Symphony Orchestras. Saulius performs in different kinds of bands. Striving to popularize percussion instruments, S. Auglys gives a lot of concerts in Lithuania, arranges pieces for the percussion instruments and writes his own pieces of music. S. Auglys’ repertory includes works by many different composers, of various styles and genres. He pays particular attention to the modern music. Music by contemporary Lithuania composers forms an important part of his repertoire, who have written and dedicated pieces to him. These include pieces by O. Balakauskas, L. Stanchikas, V. Germanavichius, Zita Bruzaite, L. Narvilaite, S. Dikciute, D. Prusevicius, M. Urbaitis, A. Malcys and A. Kucinskas. The grand concerts performed by Saulius are: at the Minsk National Philharmonic, Vilnius Town Hall, Lithuanian National Philharmonic, Lithuanian Music Academy, Warshaw music academy, Riga philharmonic (Latvia) festival „Slovianskyj bazar“ Belurusia, festival „Gaida“ Lithuania, Cross-drum percussion festival "Poland“, Festival "Probaltica“ Poland, Marimba festival (Mexico).